Troubleshooting wizard, diagnostic tool, email and phone support, and more! Without desiccants, damaging condensation (moisture) forms when the air inside the counter's case cools. 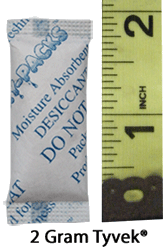 Replace the desiccant packs each time you open the counter's case to download data. TRAFx counters require very little maintenance. Neverthless, consult the maintenance section in the counter's instructions (see left). TRAFx counters have a uniquely modular design, facilitating easy "do-it-yourself" repairs with replacement parts. For example, if someone vandalizes the TRAFx Infrared Trail Counter's IR scope (the "eye"), simply order a new IR scope and replace it yourself. There is no need to ship the counter back for repair. The replacement part comes with clear "how to" instructions.